Need Digital Marketing Support for your business? The Energise Digital team is a resource that can be tailored to your needs. Our team covers the whole range of Digital Marketing Services from Strategy and Planning, Digital Audits, Digital Branding, SEO, Social Media Marketing, Advertising, Email Marketing, Blogs and Digital Content Creation. Our focus is ensuring you have the right digital foundations in place and a plan for ongoing digital activation using content and engagement to support your business and sales objectives. We aim to increase your customer acquisition by driving more of the right customers to you! Before any Digital Strategy and Planning can be achieved, it’s crucial to have clarity around your overall brand. We workshop with you to ensure there is a solid brand foundation to work from. Key Messaging – What are the right brand messages you need to communicate to your target audience so they engage with you? Value Proposition – What is your competitive advantage? What is your unique selling point? Why should customers say yes to you and no to your competitors? Target Market – Who are your target market(s)? What do they look like and how can we connect with them? Digital Fundamentals – What digital channels do you need in place to effectively reach and communicate with more of your target audience? User Journeys – Is your user experience a positive one? Does your website user journey (and connections to other channels like email marketing and social media) make sense? Will it drive the outcomes you’re expecting? SEO – What customers are you searching for? Will your website be found? Could your site be further optimised to increase your search engine ranking? Digital Content – What content do you need to create and/or develop within your website? What channels should you be using to attract more of the right customers? Digital Activation Plan – What does your six month digital plan look like? Competitor Review – what are the strengths and weaknesses of your competitors in the digital space? Tracking – defining the key metrics that measure the success of any digital activity. From the Digital Strategy & Planning phase, we may identify project work that needs to be undertaken i.e. new website, email marketing or social media set up. Projects will be scoped with you, as required and priced individually. Key to the way we work is that you are the owners of the content. You know your business and we work with you to brief us in. We then take it and shape it resulting in relevant and meaningful content engaging customers across your digital platforms. We have monthly retainer packages available that can be tailored to suit your digital needs and goals. 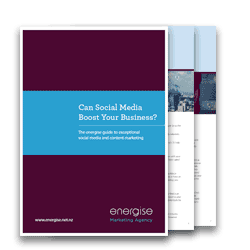 Can Social Media Boost Your Business?